Where are the TechyKids now? In March of 2017 Founder of TechyKids, Sharon Marzouk gave a Tedx talk on “The Future of Education”. She was invited to talk by one of her former 8th grade students, Nicolas Tan. Nicolas was a student of Ms. Marzouk’s at Woodland school, then attended TechyKids camp during that summer. 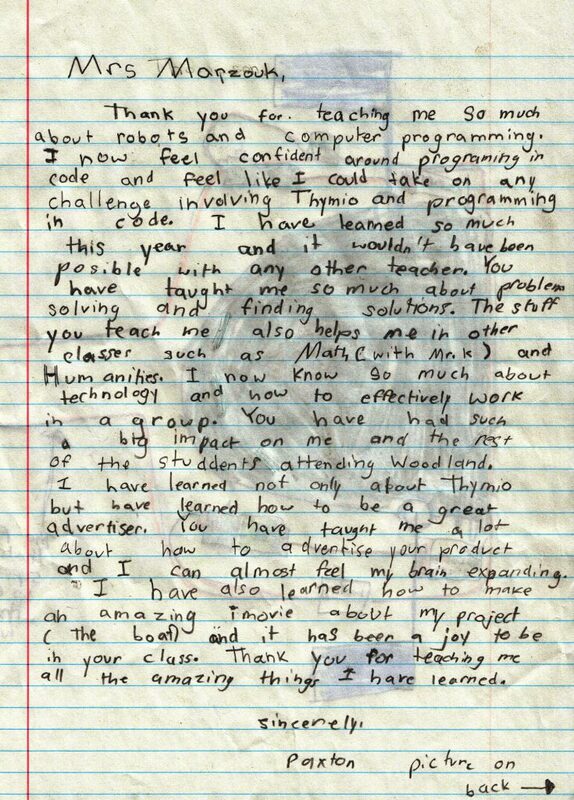 A few years later Nicolas interned for TechyKids Summer Camp. Then, later as he was President of his Tedx Club at Woodside Priory, invited her to give a talk. Nicolas is now in college, studying engineering. 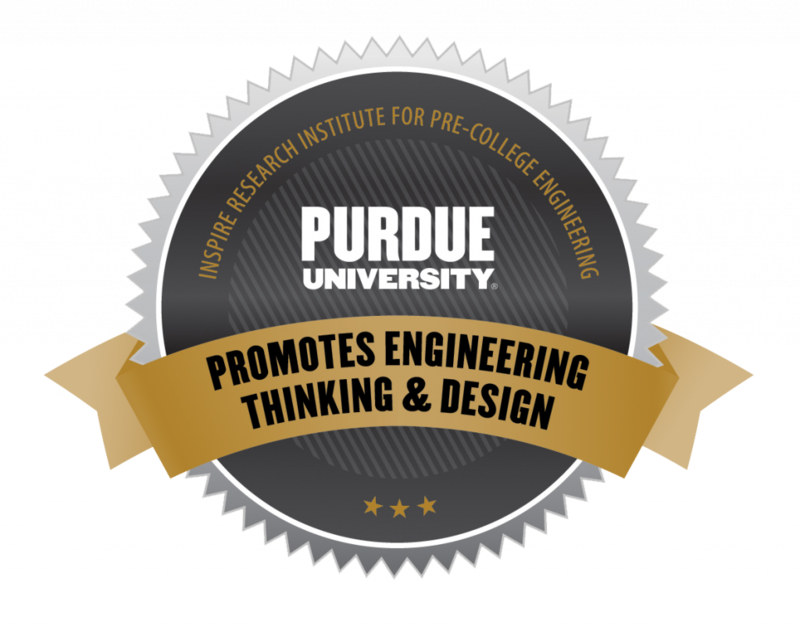 Won a Grant for TechyKids & Thymio Robots! “They get to work with the robot individually or in those small groups and it makes all their learning- problem solving skills, communication skills- all of those things get worked on with the robots,” said Delgado. “I learned a lot, it is a fantastic program. It is like having a scientist/Engineer in classroom with you. Often in the classroom you are just using the technology, but you don’t understand what is happening. 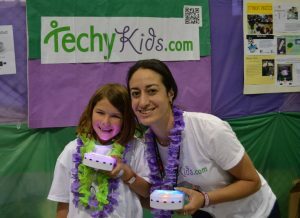 TechyKids educates students to the inner workings and engineering behind innovations and inventions. The videos really enlighten and inspire. I like to think that there’s at least one student in each group whose life choices, e.g, career, helping others, will be impacted by what you’ve shared with them. I assigned the video lessons as homework, and they could hardly wait to start their homework. 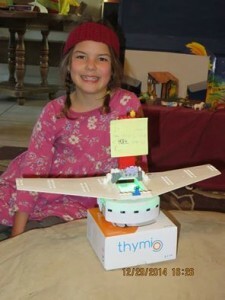 I had one very social girl stay inside during recess to carry out a plan she formulated using Thymio. She was so empowered. Also, students are very proud of their earned badges. We are loving our Thymio robots in our 9th grade classes. We are using the event based text progamming in Aseba Studio. Kids doing great stuff. 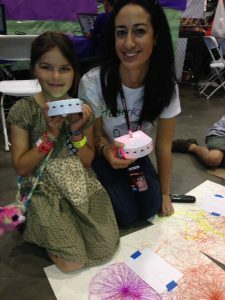 TechyKids is a great camp to let your imagination go wild. Learn cool new facts that you would never know otherwise! TechyKids is a place where imagination is encouraged and failure is just a way for you to improve. TechyKids isn’t just for kids, it’s for all ages, the coding becoming harder and harder as you go. If you can’t drive there, there’s online lessons. Sign up now! Some background: Maker Faire 2014 a girl named Normandy came and visited the TechyKids booth on Saturday. She spent hours at the booth playing and then learning to program Thymio. After being there for hours I was sad to see that she had left without saying bye. Well, she came back a few minutes later with a friend, to then teach her programming. Normandy spent the WHOLE DAY with us on Saturday! When Maker Faire was closing we said bye to Normandy. I was delighted! And the best part is the following year, Normandy came back to Maker Faire and volunteered at the TechyKids Booth! From parent who brought daughter to camp summer of 2014, from 2 hours away and stayed in a motel locally, so daughter could attend camp! We attended TechyKids Robot camp. Elizabeth and I attended last year. It was a great experience. Some other families might like this. The woman that puts this on is a teacher in the local district down in the bay. I found the environment safe and well controlled. 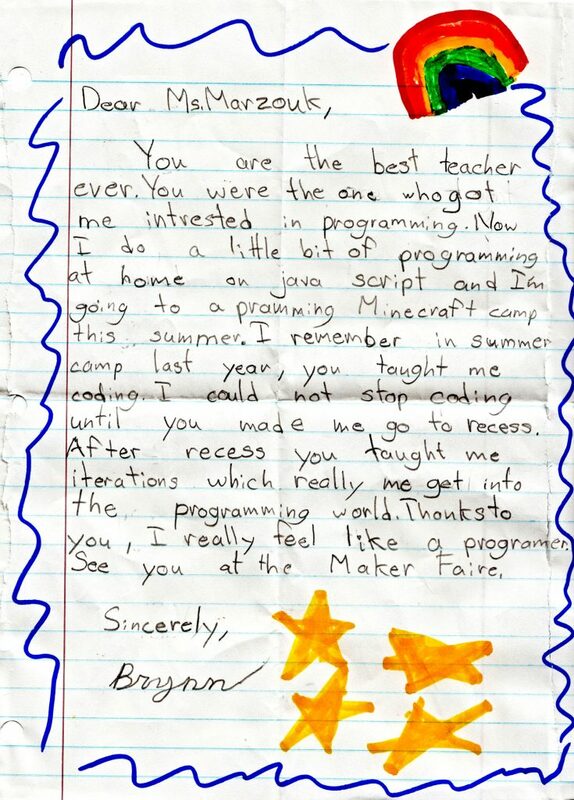 The class covered not only programming, but creativity, invention and presentation. Each day the kids learn skills to program the robot. Then they use Legos and crafting skills to create some invention. Then the use google apps to create a logo and a power point slide deck. Last year they also used a green screen and Google docs to script a movie. On Friday the teams present their work to the parents.